For this second chapter, we’ll do almost the same thing as for chapter 0: C strings & /proc, but instead we’ll access the virtual memory of a running Python 3 script. It won’t be as straightfoward. Let’s take this as an excuse to look at some Python 3 internals! This article is based on everything we learned in the previous chapter. Please read (and understand) chapter 0: C strings & /proc before reading this one. We’ll first use this script (main.py) and try to modify the “string” Holberton in the virtual memory of the process running it. As you can see, we are using a bytes object (we use a b in front of our string literal) to store our string. This type will store the characters of the string as bytes (vs potentially multibytes – you can read the unicodeobject.h to learn more about how Python 3 encodes strings). This ensures that the string will be a succession of ASCII-values in the virtual memory of the process running the script. Everything in Python is an object: integers, strings, bytes, functions, everything. So the line s = b"Holberton" should create an object of type bytes, and store the string b"Holberton somewhere in memory. Probably in the heap since it has to reserve space for the object and the bytes referenced by or stored in the object (at this point we don’t know about the exact implementation). At this point main.py is waiting for the user to hit Enter. That corresponds to the line sys.stdin.read(1) in our code. julien@holberton:~/holberton/w/hackthevm1$ sudo ./read_write_heap.py 3929 Holberton "~ Betty ~"
We found the string “Holberton” and replaced it, but it was not the correct string? Before we go down the rabbit hole, we have one more thing to check. Our script stops when it finds the first occurence of the string. Let’s run it several times to see if there are more occurences of the same string in the heap. 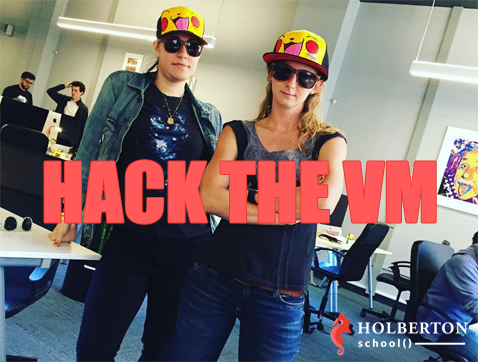 julien@holberton:~/holberton/w/hackthevm1$ sudo ./read_write_heap.py 4051 Holberton "~ Betty ~"
julien@holberton:~/holberton/w/hackthevm1$ sudo ./read_write_stack.py 4124 Holberton "~ Betty ~"
Note: It is important to note that there are many implementations of Python 3. In this article, we are using the original and most commonly used: CPython (coded in C). What we are about to say about Python 3 will only be true for this implementation. There is a simple way to know where the object (be careful, the object is not the string) is in the virtual memory. CPython has a specific implementation of the id() builtin: id() will return the address of the object in memory. -> 0x7f343f010210. Let’s look at /proc/ to understand where exactly our object is located. -> Our object is stored in the following memory region: 7f343f000000-7f343f1b6000 rw-p 00000000 00:00 0, which is not the heap, and not the stack. That confirms what we saw earlier. But that doesn’t mean that the string itself is stored in the same memory region. For instance, the bytes object could store a pointer to the string, and not a copy of a string. Of course, at this point we could search for our string in this memory region, but we want to understand and be positive we’re looking in the right area, and not use “brute force” to find the solution. It’s time to learn more about bytes objects. We are using the C implementation of Python (CPython), so let’s look at the header file for bytes objects. Note: If you don’t have the Python 3 header files, you can use this command on Ubuntu: sudo apt-get install python3-dev to downloadd them on your system. If you are using the exact same environment as me (see the “Environment” section above), you should then be able to see the Python 3 header files in the /usr/include/python3.4/ directory. *     ob_sval contains space for 'ob_size+1' elements. *     ob_shash is the hash of the string or -1 if not computed yet. What if we didn’t know about the way id was implemented in CPython? There is actually another way that we can use to find where the string is: looking at the actual object in memory. If we want to look directly at the PyBytesObject variable, we will need to create a C function, and call this C function from Python. There are different ways to call a C function from Python. We will use the simplest one: using a dynamic library. So the idea is to create a C function that is called from Python with the object as a parameter, and then “explore” this object to get the exact address of the string (as well as other information about the object). The function prototype should be: void print_python_bytes(PyObject *p);, where p is a pointer to our object (so p stores the address of our object in the virtual memory). It doesn’t have to return anything. the use of objects to ensure they are properly garbage-collected. “Objects are never allocated statically or on the stack” -> ok, now we know why it was not on the stack. Objects are always accessed through pointers of the type 'PyObject *'. * not necessarily a byte count. * in addition, be cast to PyVarObject*. -> Here is the ob_size that bytesobject.h was mentioning. a "string". bytes doesn't have to be strings. ob_sval contains space for 'ob_size+1' elements. Hopefully, this should have created a dynamic library called libPython.so. an ASCII string in the entire virtual memory of a process. julien@holberton:~/holberton/w/hackthevm1$ sudo ./rw_all.py 4713 Holberton "~ Betty ~"
What is the “Holberton” string that is in the [heap] memory region? How does Python 3 allocate memory outside of the heap? If Python 3 is not using the heap, what does it refer to when it says “Objects are structures allocated on the heap” in object.h? In the meantime, if you are too curious to wait for the next article, you can try to find out yourself. If you have questions or feedback don’t hesitate to ping us on Twitter at @holbertonschool or @julienbarbier42. Haters, please send your comments to /dev/null. As always, no-one is perfect (except Chuck of course), so don’t hesitate to contribute or send me your comments. Become a Full-Stack Software Engineer! Apply now to Holberton School!